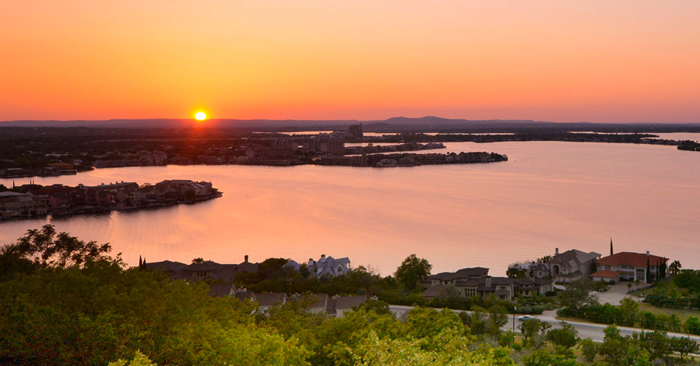 Sunset over Horseshoe Bay, Texas. Photo courtesy of the City of Horseshoe Bay. HORSESHOE BAY, Tex. (19 November 2015) – In recognition of its exemplary efforts to preserve its naturally dark nighttime conditions, the International Dark-Sky Association announced today that it has designated the City of Horseshoe Bay, Texas, as an International Dark Sky Community. The city is only the eighth Dark Sky Community ever named in the United States, and it joins the City of Dripping Springs as the second International Dark Sky Community in Texas. Along with two nearby International Dark Sky Parks, the area boasts one of the highest regional densities of IDA International Dark Sky Places in the world. Horseshoe Bay is a community of 6,500 people located in the Hill Country along the shore of Lake Lyndon B. Johnson, some 50 miles west of the state capital, Austin. Incorporated as a city in 2005, the site began as a private resort development in the early 1970s. Since then it has become a nationally-known retirement destination offering a variety of recreational activities in a pleasant and temperate year-round climate. As part of the process of applying to become an International Dark Sky Community, local officials undertook a comprehensive evaluation and modernization of the city’s outdoor lighting code. In parallel, the city organized a campaign to build public support for lighting practices that help maintain a dark nighttime character as an important element of the quality of life in Horseshoe Bay. Resident preferences of a more natural setting have resulted in conditions that supported the city’s application for IDA accreditation. The city currently has no streetlights, nor plans to install them other than in specific, future instances where street lighting is deemed critical to public safety. Similarly, the city hosts little in the way of commercial property and none of the “big box” retail outlets seen in area cities such as Austin, and no schools that might build future sports lighting installations. Horseshoe Bay has implemented a program of outreach to residents and local homebuilders stressing the importance of dark skies and informing residents on how to comply with the lighting code. It has also engaged with local property owners’ associations to help further disseminate the information.